An unashamedly old school LED matrix display board, made up of six LED matrices each 5x7 pixels (for an effective display area of 30x7) plus a decimal point, using the beautiful little Lite-On LTP-305 matrices. Use between 1 and 6 matrices in your choice of green and/or red. Perfect for building a retro scrolling message display, a tiny 30-band spectrum analyser, or a retro clock. 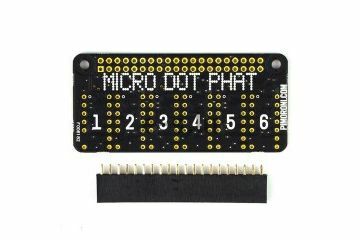 Micro Dot pHAT also works well with our other pHATs and HATs. You could use it in combination with pHAT DAC to display the audio spectrum, or with Enviro pHAT to display its temperature, pressure and light readings. 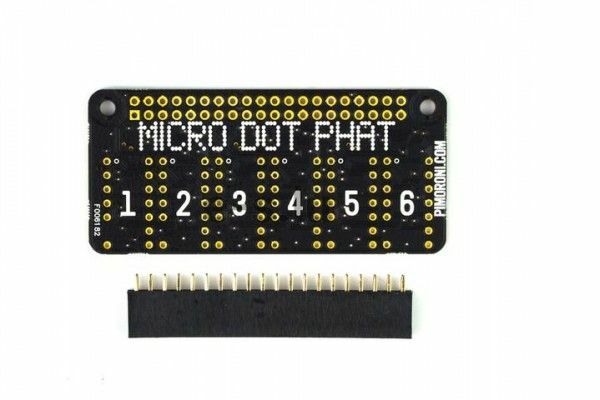 The MagPi said that Micro Dot pHAT was "certainly a cut above the standard seven-segment alternative" in their four star review. Pimoroni had put together a comprehensive Python library to make using Micro Dot pHAT really simple, as well as a guide to assembling it, and a getting started guide to show you how to install and use the Python library.